8 5/8 x 13 x 9 in. 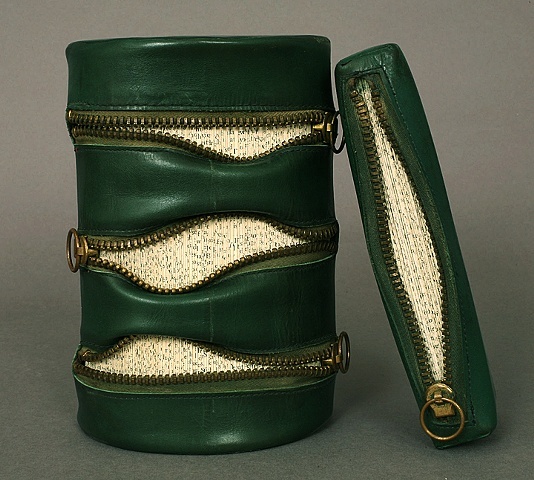 A large and a small book are each encased in green leather pouches sealed with brass zippers. The smaller volume is a mystery novel and the larger, a compendium of philosophical essays. The original hard covers of both texts were removed and every page was folded in half, giving the books a cylindrical shape when opened. A shoemaker fabricated the leather cases to my specifications so that these pocket books would fit snugly inside their custom leather purses. Simply unzipping these purses will not disclose the mysteries and philosophies within, however. Instead, the reader must dig deeper by gently pushing the pages apart to glimpse the text.